It's nice sitting in the passenger seat sometimes. After a long week in Indian Land with my friend Dave Wyman, we came back to LA via highway I10. Had an old 5D sitting on my lap with a 70-200mm lens, was snipping off shots through the windshield throughout the ride. This is one of the last shots on my CF card before day turned to eve. 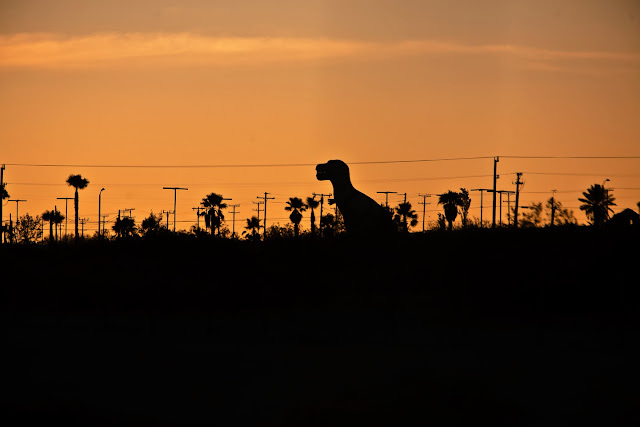 Saw what appeared to be a T-Rex walking through a silhouette maze of palm trees and power wires, and quickly shot this image. The orange sunset sky made the image. T-Rex, no gong or Pee Wee bike found. President Obama Motors Through LA.